Cap Rewards Reviews - Legit or Scam? Cap Rewards Reviews – Legit or Scam? 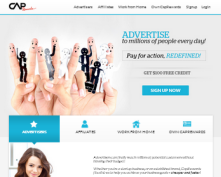 Cap Rewards, found online at CapRewards.com, is a work from home advertising opportunity which claims that anyone can earn a living from home without prior advertising or technical experience. Cap Rewards is a traditional affiliate marketing program, which promises to compensate their at home work force for any actions they take which result in sales and promotions for their partner companies. People who are interested in attempting to use this program can sign up for either a free or a paid membership, with both giving you the opportunity to earn money but with the paid membership giving you access to more tools and higher commissions. According to the website, all you have to do is login to your account, find a business you want to promote, copy an ad that has already been created, pick a destination where you would like to post the ad, and post it. Once the ad is posted, you will get paid for every unique click received by your links and banners, as well as leads that are generated and sales that are made, with sales commissions as high as $360. When you post ads for CleverDate, their online dating partner, which result in members posting profiles you will earn commissions for that, as well as when they upgrade to a paid membership. Unfortunately, CapRewards.com makes a lot of outrageous promises they can’t really live up to, first and foremost their promise that you can make “serious cash” with just five minutes of work a day. An affiliate program which promises that you can make “serious money” with no website, no experience, and really no effort above and beyond cutting and pasting some text for just five minutes a day is a company which likely can’t be trusted, or at least will be extremely disappointing to most people. The truth is that while affiliate marketing is a legitimate money making opportunity, it takes lots of hard work and effort to make a livable wage with this business, and a lot more time than just five minutes a day. Customers who are interested in trying out this opportunity for themselves should research affiliate marketing using free resources online first, then maybe try the free program without investing any money to see whether or not they feel this is a realistic system.